Hello and welcome to another fabulous (I'm sure) stamp of the month blog hop! If you've arrived here from Sheila Bennett's blog, or if you are just starting out, you are in the right place. 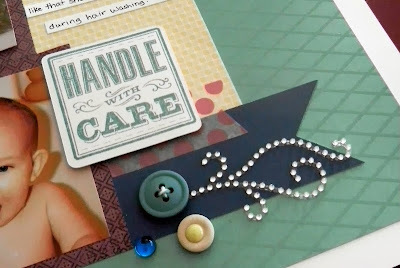 When you're done here, we'll head over to Wendy Coffman's Stamping Rules blog. And if you get lost anywhere along the way, just check this list for the next stop! Our stamp set this month is Special Care, a set of 6 large stamps with all sorts of applications - even one for mailing special packages, lol. This was a 2-page layout and the other page was not affected. But, since I no longer have anything remotely resembling the paper, stickers, etc., I recreated the whole thing. Since the pictures were all fine, I just removed them from this layout to use them in the new one. The only thing I was really sad about was all the time it took me to create the background pattern on 2 pages - those "bubbles" are Mrs. Grossman's vellum stickers, you guys! (I know, I am totally dating myself...) BUT, enough crying over spilled whatever. Just click to make it bigger! Well, my style hasn't changed much has it? I totally "cheat" with sketches All. The. Time. now! This one is from Make It from Your Heart volume 2, and I just switched it up a bit for my pictures. There is no current paper line that matched all of the colors I wanted, so I really mixed things up. This grouping uses the stamp of the month, Small Sparkles Flourishes, the Babycakes Assortment, a Blue Epoxy Bubble, button from my stash, Baker's Twine Paradise Assortment, and Party Washi Tape. 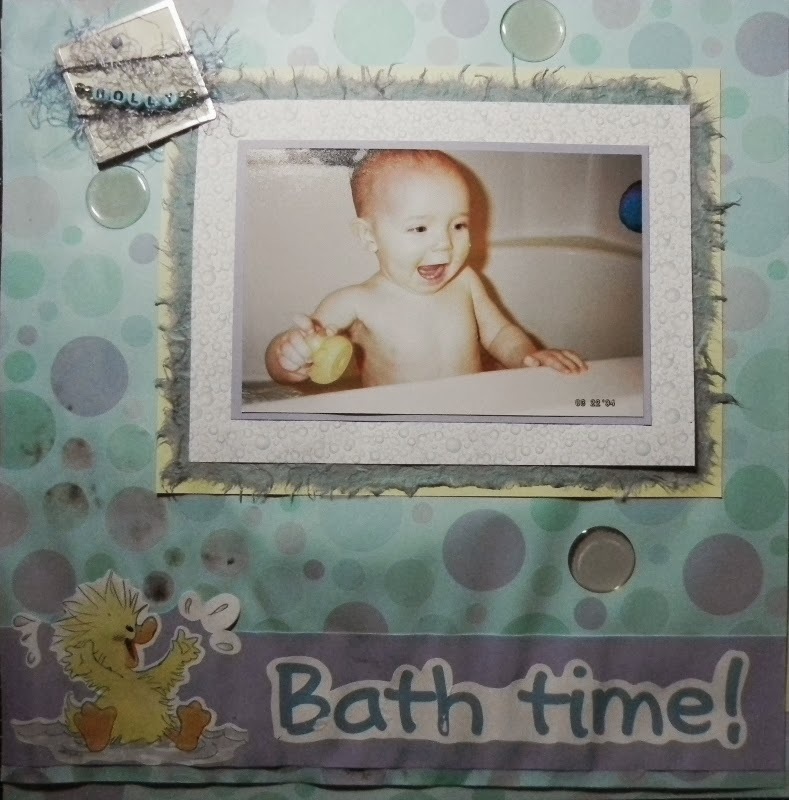 I cut out the stamped image and popped it up using foam tape. This grouping uses all of the same items listed above, with a different image from the stamp of the month. 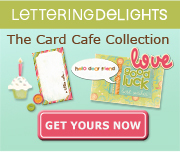 (I can totally see stamping this on some of my mail!) This image, and 2 others, coordinate with the Art Philosophy Cricut cartridge for a little time savings. More of the same embellishments for the title area. I cut the title using a phrase from the Create A Critter Cricut cartridge. So, that's all for today. I'd love for you to leave me a comment, then let's hop on over to Wendy's Stamping Rules blog and see what she created to inspire us this month! Beautiful recovery Lori! LOVE your "new" layout!! So many adorable elements you added to this page! Very cute pages. Love your embellishment clusters! I love you new layout better than the old one, personally. It's strange looking at old layouts and seeing how much our style has change. 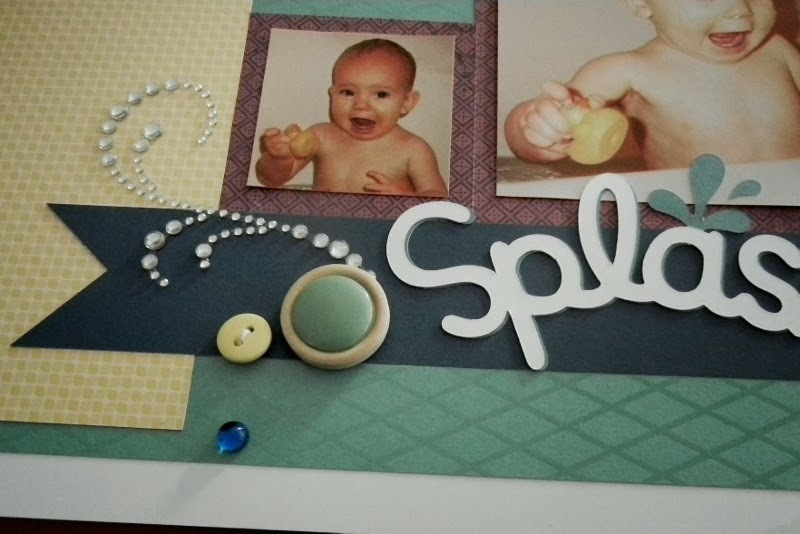 I think this kind of scrapbooking is classier than the kind from 10 years ago. I'm mean, mulberry paper? That was a horrible trend. 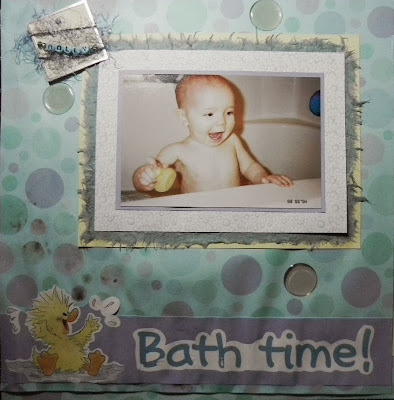 It is on over a dozen of my scrapbook pages. Lol. Sorry to hear about your molded scrapbook pages:( I do love your new one though. As Nikka said its much cleaner and makes the pictures pop. Great job! ahhh kids!! This post is really like a befor CTMH and AFTER CTMH ...I, too like the second layout..
Nice redo! Love your 2nd layout Great use of the washi tape and sparkle flourishes. 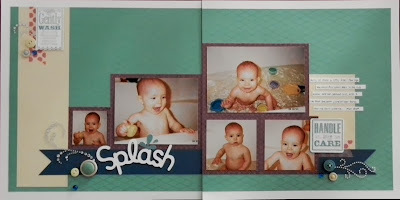 Very nice job recreating your layout - sorry your albums got wet! What a great redo! Sorry that you had to though.